Wins are wins, thus wins are always good, but Sunday night’s 6-5 Cardinals win over the Pirates was frustrating. Sure, there were good points from the offense — taking a 4-0 lead in the top of the first inning, Yadier Molina looking more like himself again at the plate with two hits and an RBI, the Cards scoring two more runs when really needed in the eighth (one courtesy of a Peter Bourjos RBI single in his first at-bat) — and, given the struggles with that part of the game this season, those were great to see. But the pitching was a different story — just good enough, obviously, even Shelby Miller against the Pirates, and maybe I’m supposed to be content with that, get my sparkly pompoms ready for the homestand and move on. But I’m concerned about Trevor Rosenthal. Yes, he’s 10 for 10 in save opportunities. Impossible to have a better success rate than that. But earning those saves has rarely been easy, especially lately. The last time he faced just three batters in earning a save was on April 25 in a 1-0 victory against this same Pittsburgh team, the day Shelby Miller vanquished his demons and finally beat the Pirates — four appearances ago. In two of Rosenthal’s three saves since then, obviously including last night, he’s allowed a run — meaning thankfully there was a two-run cushion in which he could work. A week ago today in Atlanta, as the Cardinals had a 4-3 lead, there was no cushion when he allowed a lead-off single and walk before getting Justin Upton on strikes for the final out. Last night it certainly seemed like his allow-guys-to-get-on-base-but-still-get-the-job-done-despite-all-the-panic-that-ensues strategy was finally going to blow. Sure, it provided plenty of excitement for the ESPN audience getting its first Sunday Night Baseball look at PNC Park. But loading the bases with no one out after giving up a run to make the Cards lead just 6-5 really doesn’t seem like a surefire way for continued closing success. It’s good that Ike Davis was impatient enough to swing at the first pitch and foul out, and excellent that Jordy Mercer remembered he actually had just pushed his batting average above .200 with his home run and double earlier in the game and reverted to more typical behavior by grounding into the game-ending double play. Maybe I’m not supposed to dwell on what might have been. Bottom-line: game won, save achieved, Cardinals back to .500. 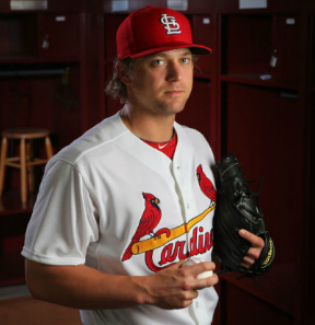 Rosenthal’s velocity has improved slightly from the beginning of the season too, with an average speed of 97.30 mph in his three appearances this month compared to 96.95 for his 10 appearances in April. But he’s allowing more baserunners this season than he has in his career — a WHIP of 1.239, a walk-per-9-innings rate of 5.3, a strikeout-to-walk ratio of 2.22 (compared to 5.40 last season). He’s getting the job done, but it’s worrisome the way in which he’s doing it. Success based on luck doesn’t seem like it will last forever, although I guess there’s no statistical formula to measure that so maybe it will. Perhaps his TWTW (thanks, Hawk Harrelson) is off the charts and that’s why Rosenthal’s continuing to succeed even with each outing lately becoming an increasingly tense tightrope walk. He said himself “we face adversity well” after last night’s game. Guess we can’t argue. Here’s hoping the general consensus that playing a long stretch now at Busch Stadium will be a benefit — as well as the key to finding the 2014 Cardinals identity that Matheny says is lacking. Small sample size, obviously, but the Cards at least are over .500 at home with a 7-5 record so far. And here’s hoping Trevor Rosenthal has plenty of chances to continue to close games during this long homestand — and that, no matter how he gets there, he does continue to succeed. Even if it’s just because he has The Will To Win. This entry was posted in 2014 Cardinals and tagged Hawk Harrelson, Mike Matheny, Peter Bourjos, Pittsburgh Pirates, Trevor Rosenthal, Yadier Molina by Christine Coleman. Bookmark the permalink.